Donn Alan "D. A." Pennebaker (/ˈpɛnibeɪkə/, born July 15, 1925) is an American documentary filmmaker and one of the pioneers of Direct Cinema. Performing arts and politics are his primary subjects. In 2013, the Academy of Motion Picture Arts and Sciences recognized his body of work with an Academy Honorary Award or "lifetime Oscar". Pennebaker has been described as "arguably the pre-eminent chronicler of sixties counterculture". Pennebaker (known as "Penny" to his friends) was born in Evanston, Illinois, the son of Lucille Levick (née Deemer) and John Paul Pennebaker, who was a commercial photographer. 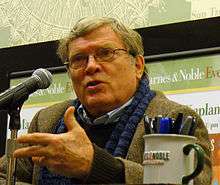 Pennebaker served in the Navy and later worked as an engineer, founding Electronics Engineering (the makers of the first computerized airline reservation system) before beginning his film career. After falling under the influence of experimental filmmaker Francis Thompson, Pennebaker directed his first film, Daybreak Express, in 1953. Set to a classic Duke Ellington recording of the same name, the five-minute short of the soon-to-be-demolished Third Avenue elevated subway station in New York City is the earliest known example of Pennebaker's penchant for blending together documentary and experimental filmmaking techniques. According to Pennebaker, Ellington responded favourably to the film. In 1959, Pennebaker joined the equipment-sharing Filmakers' [sic] Co-op and co-founded Drew Associates with Richard Leacock and former LIFE magazine editor and correspondent Robert Drew. A crucial moment in the development of Direct Cinema, the collective produced documentary films for clients like ABC News (for their television series, Close-up) and Time-Life Broadcast (for their syndicated television series, Living Camera). Their first major film, Primary (1960), documented John F. Kennedy and Hubert Humphrey's respective campaigns in the 1960 Wisconsin Democratic Primary election. Drew, Leacock and Pennebaker, as well as photographers Albert Maysles, Terrence McCartney Filgate and Bill Knoll, all filmed the campaigning from dawn to midnight over the course of five days. Widely considered to be the first candid and comprehensive look at the day-by-day events of a Presidential race, it was the first film in which the sync sound camera could move freely with characters throughout a breaking story, a major technical achievement that laid the groundwork for modern-day documentary filmmaking. It would later be selected as an historic American film for inclusion in the Library of Congress' National Film Registry in 1990. Drew Associates would produce nine more documentaries for Living Camera, including Crisis, which chronicled President Kennedy and Attorney General Robert Kennedy's conflict with governor George Wallace over school desegregation. Then in 1963, Pennebaker and Leacock left the organization to form their own production firm, Leacock-Pennebaker, Inc. Pennebaker would direct a number of short films over the course of two years. One of them was a rare recording of jazz vocalist Dave Lambert, as he formed a new quintet with singers such as David Lucas, and auditioned for RCA. The audition was not successful, and Lambert died suddenly in a car accident shortly thereafter, leaving Pennebaker's film as one of the few visual recordings of the singer, and the only recording of the songs in those rehearsals. The documentary got attention in Europe, and a few weeks later, Bob Dylan's manager, Albert Grossman, approached Pennebaker about filming Dylan while he was touring in England. Bob Dylan holds a cue card in the opening sequence of Dont Look Back. The resulting work, Dont Look Back (there is no apostrophe in the title) became a landmark in both film and rock history, "evoking the '60s like few other documents", according to film critic Jonathan Rosenbaum. 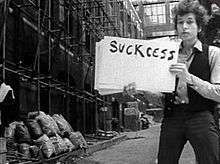 The opening sequence alone (set to Dylan's "Subterranean Homesick Blues" with Dylan standing in an alleyway, dropping cardboard flash cards) became a precursor to modern music videos. It would later be included in the Library of Congress' National Film Registry in 1998, and it was later ranked at No. 6 on Time Out magazine's list of the 50 best documentaries of all time. Pennebaker would also film Dylan's subsequent tour of England in 1966, but while some of this work has been released in different forms (supplying the framework for Martin Scorsese's Bob Dylan documentary, No Direction Home, and re-edited by Dylan himself in the rarely distributed Eat the Document), Pennebaker's own film of the tour (Something Is Happening) remains unreleased. Nevertheless, the tour itself has become one of the most celebrated events in rock history, and some of the Nagra recordings made for Pennebaker's film were later released on Dylan's own records. The same year Dont Look Back was released in theaters, Pennebaker worked with author Norman Mailer on the first of many film collaborations. He was also hired to film the Monterey Pop Festival, which is now regarded as an important event in rock history on par with 1969's Woodstock Festival. Pennebaker produced a number of films from the event, capturing breakthrough performances from the Jimi Hendrix Experience, Otis Redding and Janis Joplin that remain seminal documents in rock history. The first of these films, Monterey Pop, was released in 1968 and was later ranked at No. 42 on Time Out magazine's list of the 50 best documentaries of all time. Other performers like Jefferson Airplane and the Who also received major exposure from Pennebaker's work. Pennebaker continued to film some of the era's most influential rock artists, including John Lennon (whom he first met while filming Dylan in England), Little Richard, Jerry Lee Lewis, and David Bowie during his "farewell" concert in 1973. He also collaborated with Jean-Luc Godard, who had been impressed by Primary. Their initial plan was to film "whatever we saw happening around us" in a small town in France, but this never came to fruition. In 1968, the two worked on a film that Godard initially conceived as "One AM" (One American Movie) on the subject of anticipated mass struggles in the United States – similar to the uprisings in France that year. When it became clear that Godard's assessment was incorrect, he abandoned the film. Pennebaker eventually finished the project himself and released it several years later as One PM, meaning "One Perfect Movie" to Pennebaker and "One Pennebaker Movie" to Godard. Pennebaker's film company was also a notable distributor of foreign films, including Godard's La Chinoise (the American opening of which became the context for One PM), but the endeavor was ultimately a short-lived and costly business venture. Then around 1976, Pennebaker met experimental filmmaker turned documentarian Chris Hegedus. The two soon became collaborators and then married in 1982. In 1988, Pennebaker, Hegedus and David Dawkins followed Depeche Mode as they toured the U.S. in support of Music for the Masses, their commercial breakthrough in America. The resulting film, 101, was released the following year. In various interviews, DVD commentaries and on their own website, both Pennebaker and Hegedus have cited 101 as "their favorite" and "the one that was the most fun to make" out of all their films to date. In 1992, during the start of the Democratic primaries, Pennebaker and Hegedus approached campaign officials for Arkansas governor Bill Clinton about filming his presidential run. They were granted limited access to the candidate but allowed to focus on lead strategist James Carville and communications director George Stephanopoulos. The resulting work, The War Room, became one of their most celebrated films, winning the award for Best Documentary from the National Board of Review of Motion Pictures and earning an Academy Award nomination for Best Documentary Feature. Pennebaker and Hegedus continue to produce a large number of documentary films through their company, Pennebaker Hegedus Films, most notably Moon Over Broadway (1998), Down from the Mountain (2001), Startup.com (2001), Elaine Stritch: At Liberty (2004), Al Franken: God Spoke (2006), and Kings of Pastry (2009). In May 2010, they directed their first live show when they directed a YouTube webcast of the National performing a benefit show at the Brooklyn Academy of Music. That same year Kings of Pastry opened at multiple film festivals, including IDFA, Sheffield Doc/Fest, DOX BOX, the Berlin International Film Festival and Hot Docs, before premiering in New York City. Needham received a Lifetime Achievement Award from the Taurus World Stunt Awards. In 2012 he was awarded a Governors Award, introduced by Michael Moore. Currently, Pennebaker and his wife are creating a documentary that will focus on the Nonhuman Rights Project and its efforts to have certain animals, such as cetaceans, elephants, and apes, be classified as legal persons. An accomplished engineer, Pennebaker developed one of the first fully portable, synchronized 16mm camera and sound recording systems which revolutionized modern filmmaking. His aesthetic and technical breakthroughs have also had a major influence on narrative filmmaking, influencing such realist masterworks as Barbara Loden's Wanda, which was filmed and edited by one of Pennebaker's protégés, Nicholas Proferes, and even popular satires such as Tim Robbins' Bob Roberts. ↑ Taylor, Drew. "Honorary Oscars Go To Documentarian D.A. Pennebaker & More | IndieWire". IndieWire.com. Retrieved November 21, 2012. ↑ Lim, Dennis (November 23, 1997). "Arts: A marriage made in verite". The Independent. London. Archived from the original on June 5, 2015. Retrieved 6 June 2015. 1 2 Phillips, Richard. "Pennebaker and Hegedus: seminal figures in American documentary film". World Socialist Web Site. International Committee of the Fourth International. Retrieved June 2, 2013. 1 2 Pennebaker, D.A. (1964). "The Audition". Pennebaker Hegedus Films. Archived from the original (video) on July 21, 2011. Retrieved June 4, 2011. 1 2 Myers, Marc (May 31, 2011). "Dave Lambert: Audition at RCA". JazzWax. Retrieved June 4, 2011. Wikimedia Commons has media related to D. A. Pennebaker.